Flight Planner 3000 is a comprehensive flight planning tool which produces detailed, accurate flight plans plus provides the pilot with additional information relating to the flight. It does the weight & balance, calculates CP & PNR’s, first and last light, does all the fuel calculations, draws detailed maps of your route, displays the different (NAS) airspace on the maps, produces diagrams for over 3000 airfields, contains over 200 sample aircraft and helicopters, applies area winds, optimises the flight plan, includes LSALTS, produced flight information sheets, uploads waypoints and routes to your GPS, uploads aircraft, waypoints and data to the CoPilot (Palm PDA) software, displays live GPS moving map data, does flight costing including landing fees, automatically connects to NAIPS and downloads weather and NOTAM's for the flight . 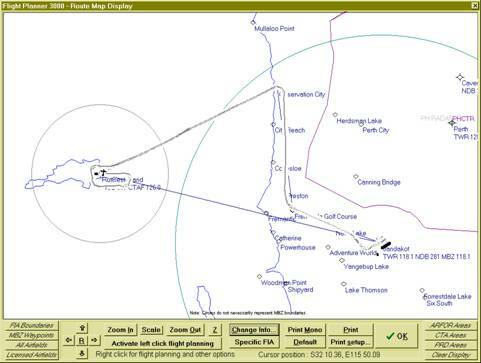 It is suitable for all flight planning from ultralight to jet operations, includes online help and it is EASY TO USE.Flight Planner 3000 can be installed on an individual PC, or on a memory stick (for portability) or on a server (for concurrent access by a number of users). 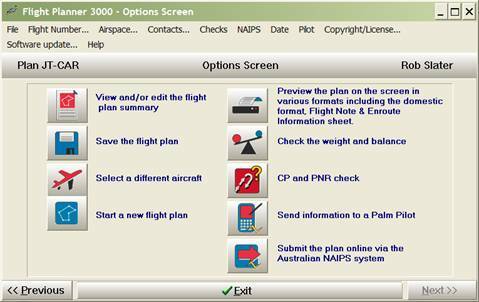 Install the Flight Planner 3000 software (including updates and demo. kits) by running the SETUP.EXE on the CD or WWW file downloaded. Press START then RUN then type D:\SETUP or A:\INSTALL in the open box, then press OK. (Windows 95/98/3000/ME/XP/NT/Vista). 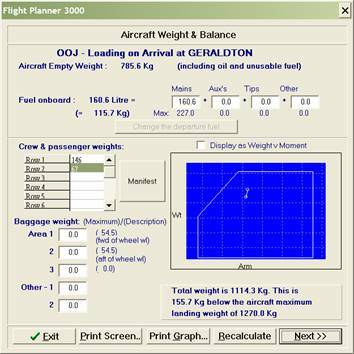 Ease of use is one of the most significant features of the Flight Planner software. 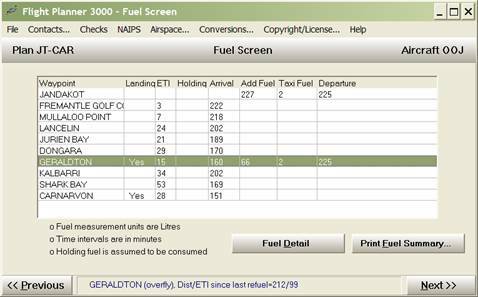 The sample screens below show the normal usage pattern for the software - the flow from the Aircraft screen to the Segment Screen, the Fuel screen and then to the Options screen. 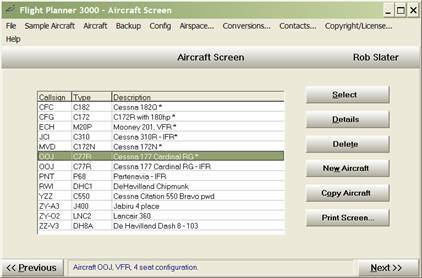 Firstly select an aircraft from the Aircraft Screen....(If you have not set up any aircraft press the New Aircraft button to enter your aircraft details or select an aircraft from the sample aircraft database by clicking on the Sample Aircraft menu at the top of the screen. There are a wide range of sample aircraft types (over 210 including singles, twins, turbine aircraft, jets, warbirds, and helicopters) available. Press the Next >> button (bottom Right hand corner) to move on to the Segment Screen. The route is nominated by pressing the Add Waypoint button until the route is complete. Use the (fully automatic) NAIPS download facility at this stage to get weather and NOTAMS specific to this flight (available in Australia only). The flight plan is complete! 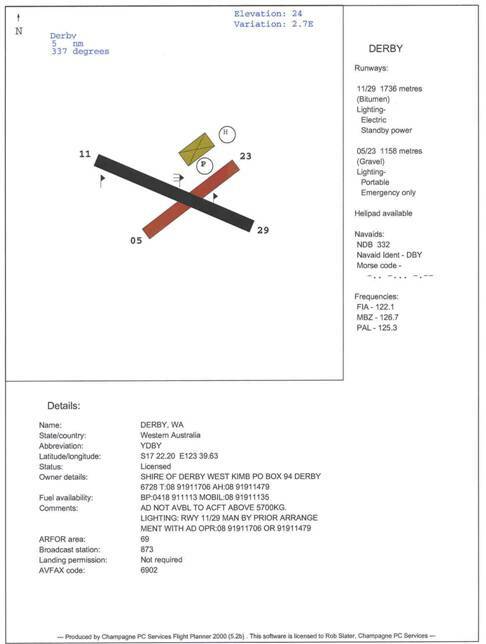 Preview/modify it on the screen prior to printing (or faxing) it or submitting it directly to NAIPS, saving it, checking the weight & balance, changing aircraft or checking the CP & PNR for the flight. Or you can press the Previous >> button to go backwards through the above screens to modify any aspect of the flight plan. We recommend using the NAIPS interface to send the domestic flight notification to the briefing office, and printing the detailed flight plan sheet (or the flight summary sheet) plus the Enroute Information sheet for use in the cockpit. Flight planning is this simple with Flight Planner 3000! The software also contains extensive graphics displays that can have a variety of information overlaid. The Route Map Display below shows the FIA boundaries and licensed airfields for a flight. Press the Route Map Display button on the Segment Screen and add the detail you require. These displays are full screen, and can be printed for reference during the flight. This display is extremely flexible! Display airspace for the flight, CTAF’s, locations with fuel, grid LSALTS, IFR routes, danger areas, airfields, VFR or IFR reporting points, WAC chart boundaries, ARFOR areas, locations with lights, airfield within a given distance from the route, HF boundaries, WAC chart boundaries, waypoints with fuel or lighting, zoom in and out, even display the runway configuration at landing points! Weight & balance is easy via the Graphical Weight and Balance display – select it from the Options Screen. You can put your passenger/baggage load in and it will tell you how much fuel you can carry! 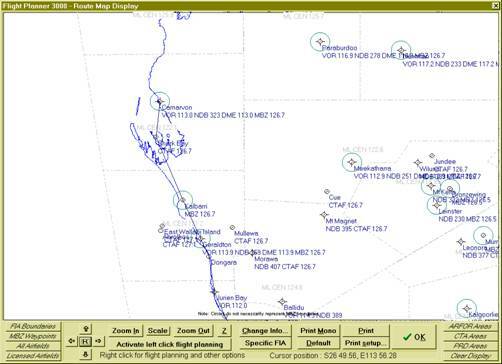 The software has thousands of airfields with detailed data included. This printed in a convenient one-page format – print it from the Waypoint Details Screen. Print copies of the airfields for the flight plus the Enroute Information Sheet (Options Screen, P button) whenever you fly. You will have the information you need at your fingertips. 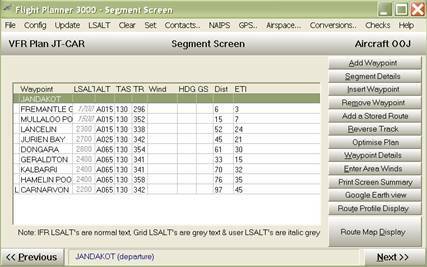 Flight Planner 3000 also has inbuilt support for GPS units that run the Garmin and/or the NMEA protocol. This includes all the Garmin units and a number of others. Upload waypoints from the flight plan plus bulk waypoint uploads and live GPS moving map support. Have your real time aircraft position, speed and altitude displayed on the Flight Planner Route Map Display! Right click on the Route Map Display and select GPS to activate the full range of GPS facilities in the software. The Route Profile display (below) is a vertical view of your flight showing your climb, cruise and descent sections of the flight, plus the lowest safe altitude for each segment and the top of climb and the top of descent points. Other advanced feature of Flight Planner 3000 include upload of data (waypoints, aircraft, flight plans) to handheld GPS’s and also to Palm Pilot PDA’s, the new vertical route profile (showing climb and descent profile), full multi-user network support, option for pilot selection from a list, advanced security features to ensure the integrity of flight planning data, etc. 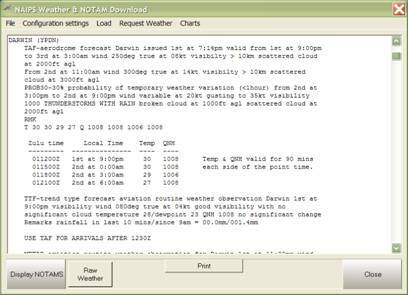 The Flight Planner software has an in-build easy NAIPS interface… Just click on NAIPS at the top of the Segment Screen to directly access NAIPS weather and NOTAMS for the flight (SPFIB), and on the OPTIONS screen there is a NAIPS drop down menu to submit the flight plan, including Sartime flight notifications. You will be required to have a NAIPS username and password (issued by Airservices) to access NAIPS. Enter this information (click on “ConfigurationSettings>Naips Username/Password” at the top of the NAIPS screen) and you should be able to connect to NAIPS. 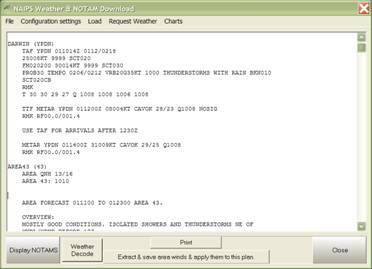 One of the very advanced features of the software is the Weather Decode – automatically converts a complete NAIPS weather briefing to plain English, including decoding all weather and location abbreviations, decoding date/time fields and converting Zulu time to local time!